trvlvip and Google Flights, When Used Together, Open Up a World of New Opportunities for Loyalty Travelers! 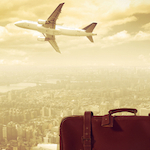 Google may not be the first brand that comes to mind when you think of travel planning. Expedia? Priceline? Both good, and perhaps more familiar. But Google has expanded the functionality of their Google Flights site to introduce impressive new travel tools that are hard to beat when planning your next trip. Google's study of 2014 travel trends estimated that when travelers first sat down to plan their next trip, over 65% were undecided on where they wanted to go and how they planned to get there. And, not surprisingly, approximately 75% used the Internet as the top source when planning their trip! With that in mind, there are two great tools that, when used in combination, really help simplify your loyalty travel planning – trvlvip and Google Flights! Don’t let the overwhelming aspects of trip planning keep you from traveling. A little inspiration and ease of use can go a long way towards making your next great trip happen! For most vacation travelers, the criteria for choosing their next trip is a combination of destination, duration, comfort and price. And the same is true for travelers focused on loyalty. Airline, hotel and car rental loyalty programs provide a fast track to more comfort and luxury whether you travel for business or pleasure. Frequent flyer miles turn into free trips. Elite status leads to shorter lines, complimentary upgrades, access to luxurious lounges and flexible check-in and check-out times at hotels. And now Google Flights will help you uncover the best-priced airfares while factoring in your preferred travel destinations, dates and the loyalty programs too! For many years travel industry experts have raved about the ITA Matrix software, but many outside the industry shied away due to the complexity of the tool. When Google purchased this flight search powerhouse they expertly cloaked the daunting mechanics inside of Google’s much vaunted user-friendly interface. The result is a new level of search and filter functionality in a very simple-to-use package, which allows all users to have an expert advantage. It’s not the day of the week you book that ensures the best deal, it’s your flexibility and the fact that Google Fights uncovers amazing deals like no other site. Just use the “Best Flights” feature to find the best price and then compare it to common trade-offs like number of stops, duration, airline choice and flight times from the drop down menus. There is a simple 80/20 rule going on with this one. According to Google, the vast majority of travelers find their flights using the “Best Flights” feature and thereby enjoy the best combination of price and convenience. The trvlvip Edge: Unlike other travel search sites, Google Flights presents fares from multiple airlines and the major airline alliances, thereby allowing loyalty frequent fliers to select which airline or airline alliance best fits their needs! This provides trvlvip Members with a great way to maximize their Loyalty and turn it into Luxury! The trvlvip Edge: When pursuing special loyalty program Perks and Tips, timing is often everything. Some promotions are only valid within a certain window of time or only under certain itinerary conditions. Google Flights makes it simple for trvlvip Members to sort and filter their choices according to the conditions of those travel loyalty Perks and Tips! 3. Dream up your next trip with the “Explore Map”and "I'm Feeling Lucky"
Now, for those 65% of undecided planners that need a bit of inspiration, Google has you covered! Google Flights enables you to view flight prices and options across regions and even entire countries (e.g. flights to all of Europe, South East Asia, India, etc.). You can also scan the entire world map for accurate prices for all the major cities connected to your departure airport. And the “I’m Feeling Lucky” button found on the map will present ideas based on popular destinations and your past search history. The trvlvip Edge: trvlvip Members are nothing if not an inspired bunch! We seek to teach and tempt our Members with only the most remarkable opportunities in the travel loyalty industry. And Google Flights shares our intent to inspire great travel. Well, are you feeling lucky yet? Well, are ya?? trvlvip provides a simple way to review the current Perks and promotions across the largest airlines, hotel chains and car rental companies. These ongoing promotions and specials save you money, allow you to enjoy extra comfort, and provide special incentives to earn and redeem points and miles. And if you don’t know about those Perks and promotions, you often miss out! No more going to multiple airline, hotel and car rental websites to search for the current specials and promotions. No more digging through your email to find out what specials found their way to your inbox. trvlvip pulls it all together for you and has a very easy "Filter by Program" function to easily see the current Perks for the programs you care about most! A lucrative travel loyalty promotion or discount is often a deciding factor for whether to choose one airline, hotel or car rental company over the others. And amazing promotions often provide an incentive to choose one destination over another when planning a vacation. trvlvip is also an excellent tool to browse through and filter travel Tips for strategic pointers on your favorite programs. And, most importantly, you can sign up to receive complimentary email updates for those travel reward programs you care about most, thereby simplifying things even further to ensure that you never miss out on another important promotion. When you want to save money without sacrificing luxury or convenience, combining trvlvip and Google Flights is just smart business. So dig in and start planning your next memorable trip today! Our Perks and Tips are your ticket to luxury travel for less and will open up a world of Elite benefits! We encourage you to sign up for complimentary email alerts so you never again miss an important update on the programs you care about most! Google Flights is in no way affiliated with trvlvip, nor is the content herein intended to convey an endorsement by Google or Google Flights of trvlvip.